Pain in the ball of the foot is the second most common foot complaint (after heel pain) in Australia. The medical term for this condition is “Metatarsalgia”. Ball of foot pain is very common in women who wear tight fashion shoes with a high or medium heel, but it can also occur when wearing regular, flat shoes. Equally, many men suffer from this foot condition, often a result of being on their feet for long hours in work shoes or boots. Fortunately, this is a condition that can be treated. 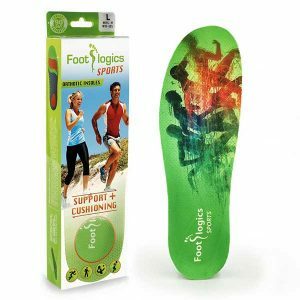 With the right Footlogics orthotics, that painful burning sensation in the balls of your feet will get better, and allow you to wear your high heels, enjoy your run, or simply do your job pain-free once again! 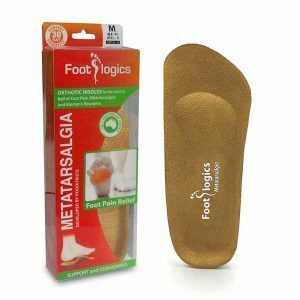 Metatarsalgia is often described by sufferers as a sharp or burning pain under the balls of the feet. Sometimes pain is present in the area around the second, third or fourth toes. The pain gets worse when you stand, walk or run and improves with resting. Some people have a feeling that there is a pebble in their shoe. Most sufferers report that walking barefoot is often too painful. Wearing (high) heels or work boots without much cushioning for long periods often leads to painful, burning balls of the foot. How long is long? For some this pain can be experienced from within seconds of putting on their shoes. When wearing high heels, about 70-80% of your body weight is shifted forward, onto the balls of your feet. When this happens, the metatarsals (forefoot bones) drop and the surrounding ligaments weaken. The entire forefoot structure will collapse, in turn leading to excess pressure and friction under the ball of the foot thus resulting in ‘Hot Feet’. There are a number of causes for this type of foot pain in regular, flat shoes: for example, running for sport, or walking long distances. Standing for long periods of time in hard shoes and boots can cause ball of foot pain. This condition is therefore quite common in people employed with the police, military, security, farming, teaching, tradesmen etc. Being overweight can also play a role, as this places excessive pressure on the feet. Our feet consist of 26 bones, held together through a web of muscles and ligaments. The foot is not flat on the ground but is held up in the middle forming two arches: the Longitudinal arch (or instep) running along the foot from the heel to the toes and the Transverse arch which runs across the foot. Five metatarsal bones run from the middle of the foot to your toe joints. Over-pronation means the Longitudinal arch collapses and the ankle joint rolls inwards, every time the foot lands on the ground. A common side-effect of over-pronation is excess pressure on the metatarsals, which in turn leads to lowering (or collapsing) of the Transverse arch. The forefoot structure is severely weakened, causing pain in the ball of the foot. Wearing hard, flat shoes and walking on hard surfaces such as concrete, pavements, tiled floors and similar surfaces will make this problem even worse. 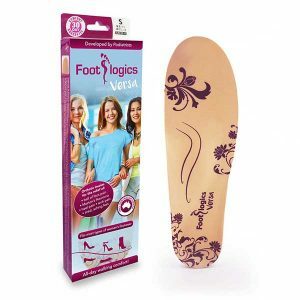 For those ladies who love wearing fashion shoes, Footlogics can help. 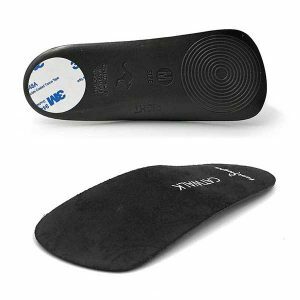 Our Catwalk and Versa insoles restore biomechanical balance; support your arches, as well as the metatarsal bones. 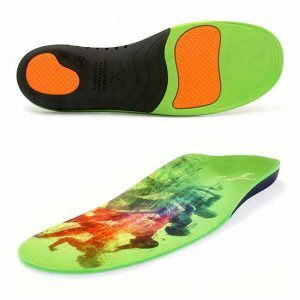 With your weight distributed evenly, using the entire foot instead of just pushing into the forefoot, These tw0 insoles prevent excessive pressure and friction in the ball of the foot. 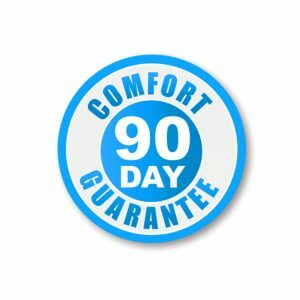 As a result the pain and the burning sensation will get better – especially with longer periods of standing or walking. 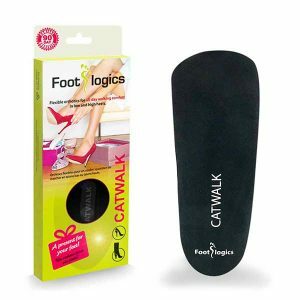 We love to hear from our customers, and among our favorite description of wearing Footlogics insoles in high heels is that it feels as though she (the wearer) is in low heeled or flat shoes…! Footlogics Australia is registered with the TGA (Therapeutic Goods Administration) under the category ‘Medical Devices’. Ball of Foot pain is not just limited to women wearing fashion shoes. Men and women alike suffer from ball of foot pain in normal, or flat shoes. 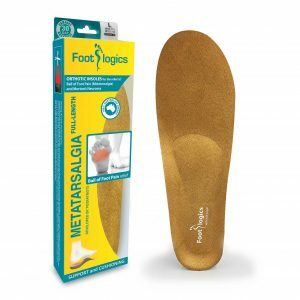 For shoes with a low of flat heel we recommend the Footlogics Metatarsalgia.This is a soft 3/4 length orthotic with excellent ball of foot cushioning, arch support and a promintent metatarsal support. By lifting the metatarsal bones in the forefoot, pressure on the ball of the foot is being reduced. 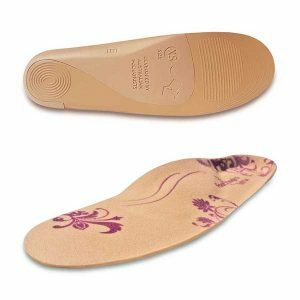 Orthotic insoles can be very effective to treat your Ball of Foot pain as they will provide the necessary biomechanical correction and prevent over-pronation. For flat lace-up shoes we recommend the Footlogics Meta Full Length. 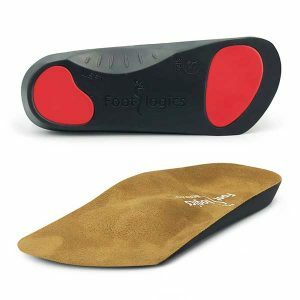 Greatly reducing the pressure and friction on the foot, Footlogics orthotics will provide long-term relief from ball of foot pain, and help rid you of that painful ‘Hot Foot’. NOTE: If pain persist we recommend you consult a health professional for appropriate diagnosis and treatment. Visit the Australian Podiatrists Association to find your local podiatrist. 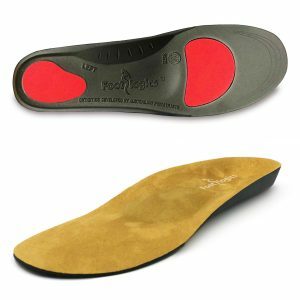 Full length orthotic for the relief of ball of foot pain (Metatarsalgia) and also Morton’s Neuroma. Features a metatarsal dome to support the forefoot structure and cushioning forefoot pad.